Guilds of Ravnica continues to wow us! Patrick and Michael continue their takes on Guilds of Ravnica and its many new cards. Michael is over the moon for this black five drop. Reminiscent of both his tap-out strategies and the Titan cycle, Doom Whisperer is one of the best “last” cards you can play. In an attrition battle? Your opponent will fade some of the time. Remember to pay 2 life? You simply won’t. That’s just the fair side! Combine Doom Whisperer with a little Jump-Start and the cards will flow. With enough life, you can self-Mill your entire deck if you have to. This would give you access to a level of self-mill that, at least according to Mike, hasn’t been seen since the days of Hermit Druid. 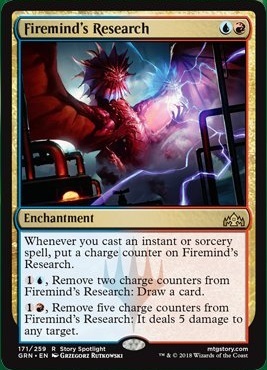 This ability — to deal a variable amount of damage — for just three mana is highly consistent with what Izzet decks seem to want to do. It’s not going to be tough to juice that graveyard… Especially when so many different cards are pointed at the same thing. Okay… Maybe not “just” cool. Cool AND good! This card has a built-in card advantage engine… Even when it’s not cheating to win the game. Only thing is? Sometimes it just wins. With a resilient toughness greater than you might typically see for a four drop, Etrata, the Silencer is tough to kill. And you can’t ever block it. Need a reason to steer clear of Mono-Green StOmPy? Look no further. 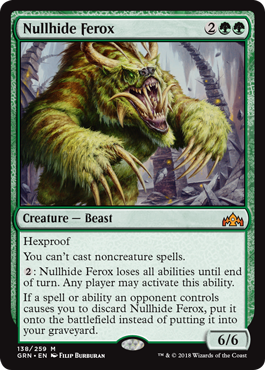 This card will shred Mono-Green if the battlefield is at parity… And there isn’t much StOmPy can do about it. Assassin’s Trophy has a down-side: That is plain to see. It in fact has the same down-side as Staples like Path to Exile and Settle the Wreckage. Mike notes how players had question marks around the white cards before they had all become so popular. This caused some players to underrate them, and might cause some players to underrate the Golgari instant. The truth is, this card is beyond flexible. Patrick thinks it would see non-zero play at four mana. It’s not actually so far off of an Utter End. Compare it to Vindicate: Once you get past the ugly down-side, Assassin’s Trophy is a full mana cheaper and an instant (versus Vindicate’s sorcery). While you can’t really get the Vindicate / Recoil play pattern of the old Esper Angels deck… We probably wouldn’t want to see that anyway. Compare it to Ghost Quarter: Mike once underrated Ghost Quarter because of the inherent lack of card advantage. The same issue is present here, and becomes pronounced if you ever point this at a land. But! What happens when you aim it at a nonbasic land? 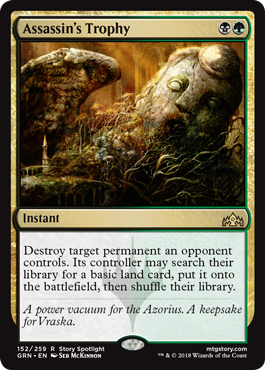 When you’re taking out an Urza’s Tower, do you care so much that they are getting a basic Forest back? It gets better: The opponent can run out of basics. At some point, you can overwhelm the opponent with so much redundancy with Field of Ruin and other, similar, effects that the opponent will literally have no basics to search up. If you have Crucible of Worlds + Ghost Quarter (in Modern), you can even start hitting their basic lands! 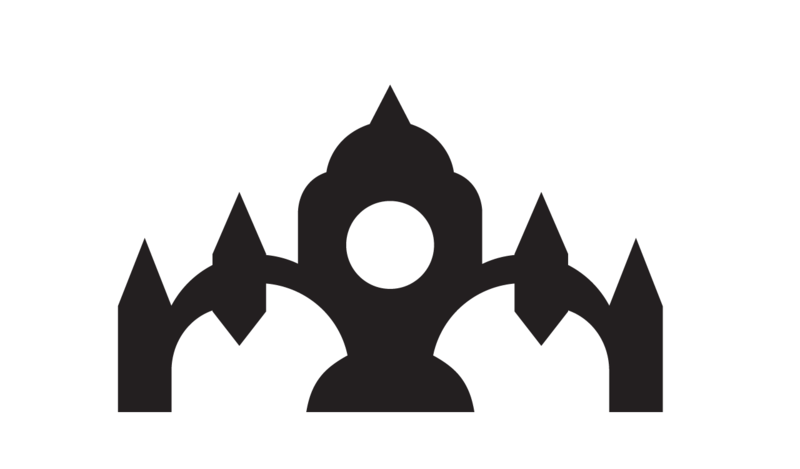 Look for this card to be a four-of Staple in Standard and wider formats. It’s so good (and so cheap to start) Mike even thinks it’ll see play in Nullhide Ferox decks. It’s so good, people will play it in the same 75 (if not 60) as a card that says you can’t cast noncreature spells. Don’t forget: Bonus episode tomorrow! 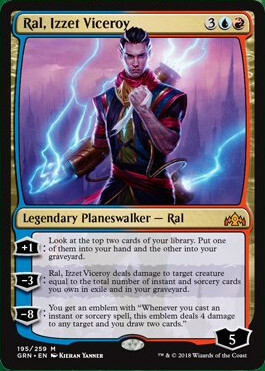 While Teferi, Hero of Dominaria is still the top Planeswalker topping control deck curves… Ral has some great things going for him. Don’t underestimate Ral’s enormous starting loyalty! Ral can essentially start at six loyalty. Even when Ral is killing a creature, he will have two loyalty left. Two is so much more than one in a world with Goblin Chainwhirler. 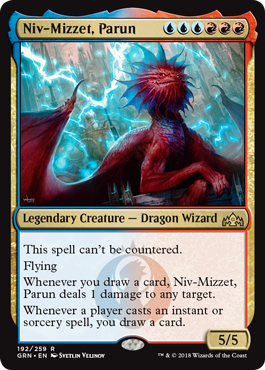 While Ral’s [-3] ability is substantially behind Teferi’s defensive ability, all three options on this card are still awesome. His card drawing ability is great and his ultimate looks backbreaking. Sinister Sabotage is the strongest Counterspell since Cryptic Command. It is intuitively more flexible than Dissolve. Surveil 1 is simply stronger than Scry 1. Both abilities can leave a useful card on top of your deck. 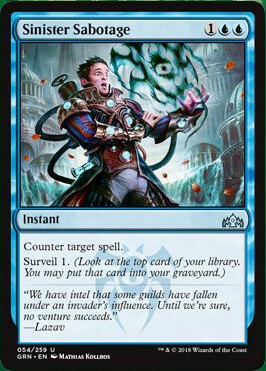 Surveil 1 can not only make it even less likely for you to draw an undesirable card than putting it on the bottom of your deck, you can also exploit graveyard synergies. For example, you can bin a card like Radical Idea (or any Jump-start card). Don’t sleep on this one: It’s awesome. On the surface, Firemind’s Research looks like a Search for Azcanta… In actuality, it’s more of a Dynavolt Tower. 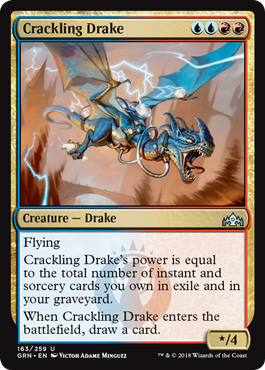 While not necessarily a four-of in every Izzet deck, this card has solid potential. It pays you back for playing the instants and sorceries you want to play anyway; plus gives you a way to win!